Located in Lenox in the Berkshires of Massachusetts, the Eastover Resort was once home to an alpine ski area. The origins of the Eastover Resort date back to 1910, when a brick mansion was constructed in Lenox as a summer home for Harris Fahnestock. Following the sale of the property in 1941, it became home to the Duncan School for Boys until 1944. In 1946, George Bisacca purchased the 500 acre property and developed a recreational resort centered around the mansion. The Eastover Resort opened in 1947. A significant investment was made in winter in 1954-55, when a new rope tow and indoor swimming pool were advertised. By the time 1956-57 rolled around, Eastover featured two rope tows. Snowmaking may have also been added around this time. A major expansion took place in 1964, when Bisacca decided to step up Eastover's skiing operation. 14,000 cubic yards of filled were hauled in, resulting in the development of the Shenandoah and Tally-Ho trails. Serving the expanded area was a new 1,500 foot Hall double chairlift, as well as a 700 foot rope tow. A 2,000 foot toboggan run was also offered. Bisacca's daughters Ticki and Susan took over the resort following his death in 1983. As the 1990s approached, the ski area's operations may have become increasingly sporadic. While the chairlift was still advertised as late as 1998-99, it may have ceased operating as early as 1995-96. Circa 2002, the double chairlift was sold to nearby Bousquet. 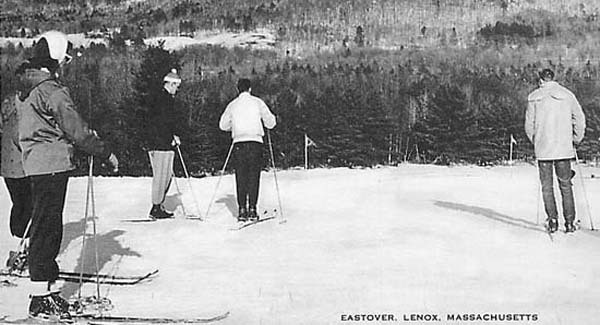 Bousquet also offered free skiing for Eastover guests for a few seasons. In March of 2004, Ticki and her daughters bought out her sister Susan and continued to operate the resort. After five years of ownership, economic problems, as well as an unsuccessful search for a buyer, resulted in the family closing the resort in November of 2009. The H.G. October Mountain Group purchased the property in early 2010 and reopened it later that year. There are no known plans to redevelop the Eastover Resort ski area. "I learned to ski and ice skate at Eastover. Our family went ever year from 1969-1982. The owners kids became friends and it was a super anticipated trip every year for a reunion with all the same families . Hopefully one day I’ll get to come back from the west coast and visit ." "I had the biggest crush on Loring! Our group, the Skunks, teased me incessantly about it. My friend and I win a costume contest dressed as “Black and Blue”, the theme song. She all in blue and I in black leotards. In the barn was where I first heard the Kingston Trio sing “Svotch and Sida”. And remember the alcohol was in the honor system?" "My husband And I were married there in 1995. We went back every year to celebrate our anniversary. We made many friends on our stays at eastover. We were very heartbroken when they decided to close down. " "Me and my frends from Brooklyn n.y. went there in the late 60 great memories especially when Loring sang his favorite song also the sing alongs at happy hour the hay rides so many memories met really great friends sorry to see that great things change all the best to everyone who were lucky to go there "
"Worked there while atteding Lenox Memorial High in the mid seventies one of the best times of my life." "first visit was our honeymoon in June, 1949. Met friends then and are still friends though our numbers are dwindling. remember Claude as our waiter. " "I was just cleaning out some old boxes and came across an Eastover brochure from the ‘70’s and decided to “Google” Eastover to see if it was still in operation. My buddies & I from Jersey used to visit Eastover on singles weekends most every winter and always had a blast. The winter sports were fun but the drinking and dancing in the Barn and the folk groups in the Tally Ho building were the best! I still remember singing about “Poor Old Charlie” and the MTA in the converted horse stables. So many great memories. Sad to see it is no longer a ski resort. " "I remember going to Eastover on a singles w/e. In 1972 or 73 and meeting a young staff member named Caryl not sure of the last name, this was at the Tally-Ho barn. It was a lot of fun, glad to see you are still doing business. Best regards; Rob "
"I WAS THERE WHEN WE LAND ON THE MOON. WHAT A SPECIAL PLACE TO BE FOR SUCH A HISTORIC EVENT. I ENJOYED JOINING THE POLAR CLUB BEING IN THE OUTSIDE IN THE THE DEAD OF WINTER. EASTER TRULY A PLACE IN PARADISEE"
"I have great memories of eastover.in 1988 I met my husband Michael Zorbo he was the landscaper.I also had i great time with all my friends from New Jersey.Michael passed away last September and I miss him every day but I have great memories of him." "In 1960, Eastover was the very first vacation I ever took as a young working woman (pre-college). My best friend and I were 18 and took the train, stayed on the third floor, loved the costume contests...I can't tell you how many bottles of champagne we won. I was Elvis one year and George's wonderful dog was "Hound Dog." I remember the great Red Robinson band and one of their favorite songs, "Black and Blue." Greased watermelons in the pool along with other relays. All the handsome college boys waiting tables for the summer. And, of course, the most fantastic mountain setting. An unforgettable time and place. " "Went there in the early60's.What a great place.Would party all weekend." "Eastover brings back soooooooooooo many great memories, especially on the Halloween and St. Patrick's weekends. Would travel there from New Jersey with my friend and meet up with a group of tire salesmen from Connecticut. The staff truly worked hard. Would love to know what that group from Connecticut are doing today. " "Eastover was special to me. I am a graduate of St Joseph High School in Pittsfield and we did our after prom party there. What a great time we had for so many years. " "To those who knew Peps Gugino for the 50 years he went to Eastover I want to let you know that my uncle passed away on Tues Mar 8,2016 at the age of 98 3/4 years old. Eastover was his joy. He made such good life-long friends. To them I want to say thank you for bringing such happiness in his life.Eloise"
"I had a marvelous time at Eastover a very long time ago...like around the late 40's, early 50's. All the girls fell in love with George Bisacca, of course, and he and his wife were very indulgent of our crushes! It was a small, intimate group that was there...like family. Nice!" "omg!eastover!!!! hahahaa! 4x with different groups of friends the halloween weekends were by far my favorite memories how the poor staff ever put up with us and many others haha! we always had loads of fun loads of drinks loads of men ! hahaa! to many funny fun memories even skinny dipped! !!! thank you for the fun memories that my kids will never know of !!! ha!" "Eastover will always be a special place for me. I was there once with our family of seven in February of 1968. The mansion was cavernous to me and the memories come back after reading what other people have written. I remember the large group meals and having hot chocolate each morning. I can still picture the museum in the basement. I also remember swimming in the indoor pool just off the learning slope. I think there was a window just inside the building which allowed us to look into the pool like an aquarium.(Accurate?) As kids we went to bed early so our parents could go join the adult festivities. Most importantly, I put on skis for the first time at Eastover. My three days on the bunny slope evolved into a lifelong hobby and trips with my own family to ski resorts across New England and Utah. My time there was short but I thank Eastover for the memories." "We enjoyed Eastover Resort for about 10 years in the 70's. We have many memories about the dancing, partying and just have a great wild time. We came as a group of about 20 from Falmouth MA. Just many great memories we could not forget." "I spend many winters vacationing a Eastover in the late 70s.As a tween, I found myself playing in the civil war room or sliding down the hill on the old wooden tobogan. I still have picture showing me getting pulled up the rope tow becoming the newest member of the polar bear club - only those who vacationed there would understand. It is and always will be my Grand Budapest. Thank you for the fond memories." "I was a guest all year because my father was a very close friend with George Bisacca. I was their almost every weekend either feeding the buffalo or gathering their remains for my fathers garden. George was a great man and taught me how to ride his famous tobaggan run standing up! William Night was the operator of the tram which brought up the hill to a cozy lodge with plenty of hot chocolate. The inside pool & sauna were waiting after. The Civil War museum downstairs was truly an experience in which I will never forget. My High School Prom (St. Joseph High School) was held at Eastover. Thanks to my father who worked at the Berkshire Eagle who annually had their Christmas party held at this resort. I am in my 60's now and nothing but fond and wonderful times & memories that George, family and staff provided me & my family for so many years. It is hard to find such resorts with make you feel at home as The 'Eastover Resort'. William R. Meade"
"I have fond memories working at Eastover during the summers in the 1960's while in college. I remember Tiki and Susan very well and worked in the kitchen for Mickey. " "My husband and I met at eastOver in the late 60's. My friends and I have such great memories of so many fun times spent there. Thanks for the memories..."
"Worked there in summers of 57' and 58, was a great time between years in college. Hated to come home at end of summer . Great memories." "My family (including aunts,uncles and cousins) went to eastover every Christmas from about 1959 to 1969. Favorite memories include the taboggan run,horseback riding, and swimming. As a young teen we had incredible freedom. We hung out on the Rathskeller, listened to music and stole soda that was always under lock and key also I remember burgers and hot dogs late at night in the barn only great memories"
"Our family went there for over 30 years total...this included 2 generations of our family ...if I HAD to choose 2 memories....they would be these....we welcomed Y2K there(both generations represented) and helped it go out with a bang at Oktoberfest 2009. My dad Zeke loved the place and when we lost Eastover it was like losing him all over again some 18 years later!" "Where do I begin, so many memories, good times and yes, insanity. It was our weekend of things you never did at home around your kids, it was all the things you told them not to do. So many nights singing, partying, just having unsupervised FUN!!!! We went every year at least one time per year for many years, some of our group are no longer with us, but oh those happy times. Thanks for the memories"
"Eastover was a yearly winter family event when we were kids in the late 60's, early 70's. Our family consisted of tons of cousins, aunts and uncles on my mother's side of the family. These memories are still talked about today. We would go from Monday to Friday and enjoy skiing, horseback riding, ice skating and tobagganing. We also remember sleigh riding down Shenandoah at night in the pitch dark while our parents were inside hanging at the bar. We would come in from the cold and travel through the hall of pictures to find our parents. We also talk about the rooms we stayed in and the free soda. So much fun and so many amazing memories were made!!" "Went on a ski weekend with the company I worked for 'Western Electric'. Was the best time of my life, especially when you are with someone you care about very much. The dancing was great, the music was great, everything was great. I particularly remember the toboggan slide and afterwards trying to get back to the top of the hill, such fun. Just wondering if your archives have group pictures stored away for the following years 1958, 59 and 60. Best time of my life." "My husband & I came with a large group for at least 20 yrs for a winter weekend away--we skied, did tobogganing, swam in the pool, went outside in our bathing suits in January, ate, drank, danced from 4-6 every night, rested & went back for more dancing from 9pm-2am--loved the turning stage with the north & south flags flying from each band, the cannon that Loring & George set off every Saturday night, the laughter, fun, blazing fireplaces, small band in the stables singing songs we all knew in a cozy atmosphere, the pictures, the food eaten with friends, etc etc. We liked it so much we brought our kids up for a summer & a winter weekend together--then when we had 9 grandkids we brought them & their parents to Eastover every year for 8 years till the year our favorite "